Ubisoft is getting ready to launch The Division 2 on PC, Xbox One and PS4 in a couple of weeks (15th March). Ahead of that time, readying itself for the release proper and stoking up interest with gamers, it has today made the open beta version of the game available. 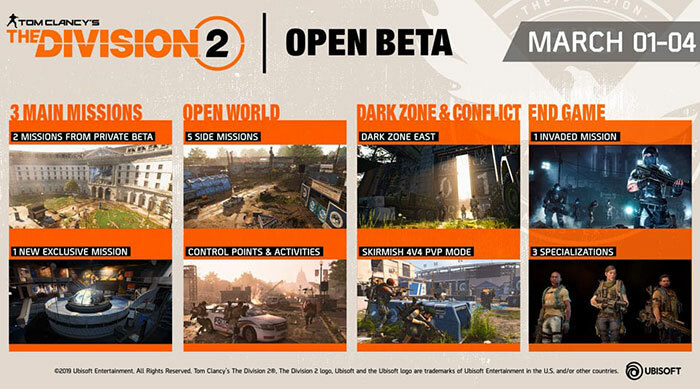 PC gamers will need to head on over to UPlay, or twiddle with their UPlay app, to download and play the open beta for The Division 2. Those with Xbox One and PS4 consoles just need to search for The Division 2 in their console dashboards. 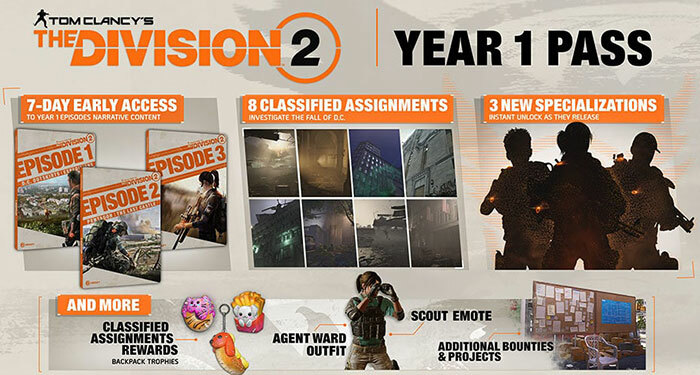 The handy graphic above gives you a quick overview of what is available in The Division 2 Open Beta. In brief, there are quite a lot of play options available this weekend including; three main story missions (playable in Normal and Hard), five side missions and other activities in the open world, one out of the three Dark Zones playable (East), PvP Skirmish 4x4, one Invaded mission (end-game content), and you can choose one of three specialisations for your character. 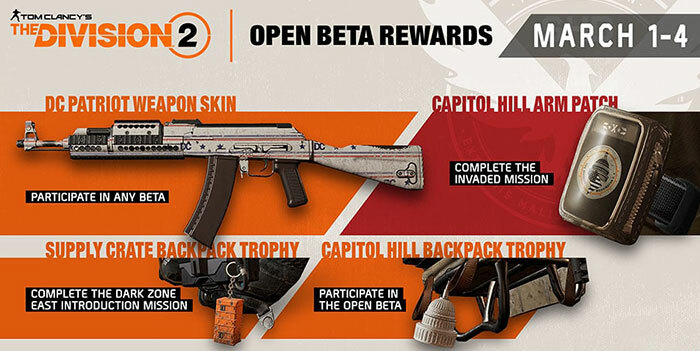 Rewards available during the open beta weekend are highlighted in the graphic above. If you head on over to the Ubisoft blog it mentions that the open beta closes on 4th March. Here in the UK the precise date time of closure will be 9am on Tuesday 5th March. Earlier this week Ubisoft detailed the first year of free content coming to The Division 2, as well as its in-game monetization plans. All buyers of the game will get three episodes during the first year, expanding on the narrative driven storyline and opening up new ways to play. Three brand new specialisations are promised for you to take on Washington's challenges (Ep.1). You can purchase the Year 1 Pass for even more content and the lure of getting the free content updates (7 days) sooner, instant unlock of Year 1 specialisations, exclusive access to classified assignments, additional bounties and projects, and extra cosmetic items. On the topic of monetisation, Ubisoft promises that anything purchasable will be cosmetic, so won't include weapons, crafting materials or other such gear. The open beta runs until 4 March, which is today, Monday. Pretty short IMHO. Especially since the servers were down for several hours over the weekend, and the beta is/was a 45 GB download. Anyway, got a look at the game and it does look even better than the first one. Gameplay-wise it didn't seem to have changed much, but that's not necessarily a bad thing.